If you're looking to carry a backup pair of earbuds for your favorite over-ears, this case is a great all-around option that won't break the bank. If you're tired of getting to the gym and realizing your Bluetooth earbuds are dead, this might be the case for you. If you have a pair of neckbuds that you don't want to wear when they're not in use, this case will keep them covered. If you can look past the price tag, the Tech Dopp Kit 2 will make you very happy. If you have a pair of Airpods, you're one bad rainstorm away from needing a new pair. This case will stop that. Whether you’re getting your first pair of headphones or your fiftieth, one of the factors that always comes into play is build quality. If you’re going to be commuting with it, will it hold up to everyday wear and tear? If you’re keeping them at home, where can you store them safely? Of course how much you care for your headphones also depends on how much you paid for them, but a solid headphone case to protect your investment is a good habit to get into whether your cans are $1,000 or $20. When it comes to headphone cases there are only a few things that you should worry about. The most important is fit. Editor’s note: this list was updated on November 30, 2018, to reflect price changes. Many commuters tend to cover their bases by carrying two pairs of headphones (speaking from experience). One pair of quality over-ears and a backup pair of cheap earbuds. If that sounds like you then the Geekria case is sure to make you happy. It’s large enough to fit a pair of headphones assuming that the pair in question has rotating earcups to lie flat, but it also has a small section in the middle that can perfectly hold a pair of earbuds or a portable amp. It also has a bit of style to it, thanks to a light gray fabric exterior. It’s not a huge deal but it’s a nice differentiating feature in a sea of leather and plastic cases. The elastic bands are bolted into the case’s interior of the V-Moda Crossfade 2 Wireless Codex. Headphone cases are useless if the headphones don’t fit in them. We’ve picked a few options here that fit all shapes and sizes of headphones, as well as one or two that are tailor-made for specific kinds. Almost as important is how much can the case withstand? Obviously, these aren’t going to be very helpful if you run them over with a truck, but if you tend to throw your headphones into your bag while commuting or have a little one around the house that might get a little too playful with your prized over-ear cans these will offer much-needed protection. The last thing to consider is the price. Luckily for you, we’ve already browsed the internet for quality cases that won’t break the bank (or your headphones). But if you’re looking for something a little more extravagant we’ve got you covered there as well. Hopefully, you’ll find something that suits your needs. So let’s get into it, what are the best headphone cases? Whether you’re going to the gym or just prefer to go wireless on your daily commute, Bluetooth earbuds can be super convenient. Not so convenient is that they run out of battery. Which is why the Mophie Power Capsule is a good option if you’re tired of getting to the gym and realizing your headphones are out of juice. It’s one of the more impressive headphone cases with an integrated 1,400mAh battery inside, which gives your earbuds an extra 60 hours of battery life. There’s even a battery indicator button and four small LED lights on the back so you know exactly how much power is left in the case. Of course, the biggest downside to this is that if you forget to also charge the case then you’re really out of luck. But if you’re looking for an easy way to not have to plug in your headphones at the end of every night, this is one of the better headphone cases out there. Neckbuds have increased in popularity thanks to products like the LG Tone and BeatsX headphones, and storing them when not in use is as easy as taking the ‘buds out of your ears and leaving them be. But if you’re not comfortable with leaving your expensive headphones dangling around your neck you can always opt for the Cosmo case, which was specifically designed to house neckbuds. Neck earbuds? Collar ‘buds? Whatever you call them, the hardshell case protects the headphones from being crushed in your bag while the PU leather gives it a stylish appearance that won’t look out of place in the office. On the inside is a mesh pocket perfect for storing cables which is super helpful, but there’s also a weird place in the center to store a charging brick. Convenient if it fits perfectly, but most likely it’ll just get in the way. Still, at least you have the option to use it if the charging brick fits. If you want something that’s a little more stylish then the This Is Ground Tech Dopp Kit 2 might pique your interest. Sure, it’s expensive but the company is known for their quality Italian vegetable-tanned leather and this case is no exception. Dual zippers keep the contents inside from spilling out and there are a plethora of organization options inside to hold anything from charging cables to pens. There’s even an extra zippered pocket for anything else you might like a portable amp. Of course, this probably won’t be the best option for over-ear headphones like the Beyerdynamic DT 990 Pro which don’t have rotating earcups and are fairly large, but if your headphones do rotate flat the Tech Dopp Kit 2 is a great all-in-one solution to carrying your gear. What if you have AirPods? Headphone cases may not make the most sense for AirPods, and for reasons I can’t explain, AirPods are exploding in popularity. In the review, I already shared how they didn’t really do it for me, but hey I’m not going to hate. If you happen to be one of those poor souls who bought a pair of AirPods, we didn’t forget about you. As useful as they might be for some people there’s still one significant issue with them: they’re not waterproof (not even the case). If you get caught in a bad rainstorm, you can kiss those ‘buds goodbye. So the case we recommend is the Catalyst case, which is a simple silicone covering that wraps perfectly around the case protecting it from harm. There’s also a few other options to choose from if you don’t want to spend too much either. What if you just have a few regular pairs of earbuds? If you’re like me, you probably have a plethora of earbuds lying around getting tangled and doing whatever else earbuds do when no one is looking. One way to keep them all organized is to get a few of these Sunmns cases. It isn’t fancy, but it’s practical. You’ll get eight cases that each have elastic mesh inside to keep your earbuds in place and come with a carabiner to clip or hang from wherever you want. Obviously, this isn’t a super clever option and you might already have one or two of these. But what makes the Sunmns cases so appealing is the different colored zippers. This not only helps you organize your earbuds but helps you color-coordinate them so you know exactly which pair you’re grabbing as you head out the door. 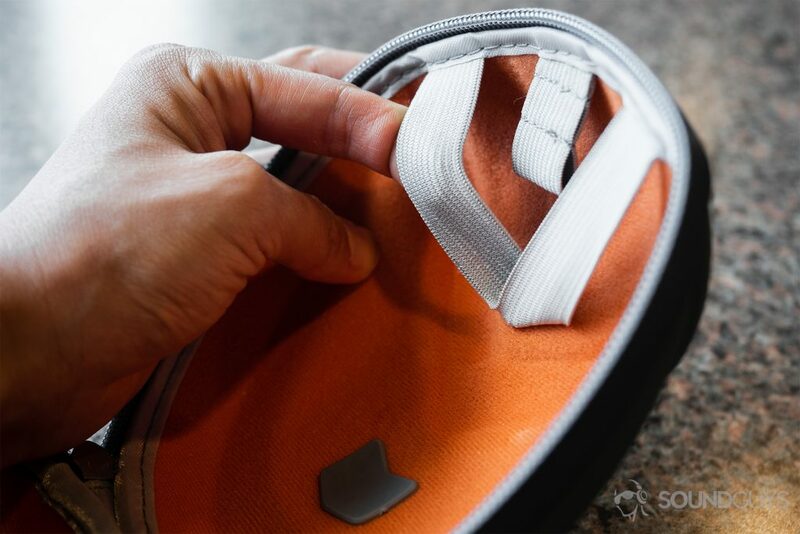 The cord roll is a simple and practical way to store your earbuds to avoid a tangled mess. If you mainly use earbuds and want something a little more minimal and (let’s face it) nicer than a bunch of plastic boxes with colored zippers, then get the Italian leather cord strap from This Is Ground. It’s a little more expensive at around $10 a pop, but it’s a little more professional looking if you’re going to be around the office.